Monsanto claims their GE crops are safe and “substantially equivalent” to other food and therefore, does not need disclosure in food labels nor extra regulation. On the other hand, they claim their GE seeds are a novel invention that requires a patent. Their Bt Corn is genetically crossed with material from a bacteria known as Bacillus thuringiensis (Bt). This corn is also registered as a pesticide. 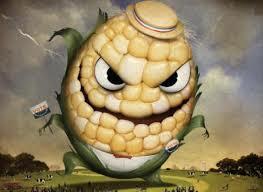 Is genetically engineered food safe? Consider the scientific studies from Professor Seralini in France. A professor of molecular biology at the University of Caen in France, Professor Gilles-Eric Seralini conducted a long term scientific study on the effects of Bt corn on rats and concluded that this corn or roundup ready fertilizer has the effect of causing cancer and severe organ damage. When these findings were first published in 2012 in Food and Chemical Toxicology (Elsevier), it caused such an uproar that Food and Chemical retracted the story on the basis that the study was full of faults and therefore unfounded. However, the study was found credible and was republished in 2014 in the open-access journal Environmental Sciences Europe. Corporations need to understand that it is necessary to learn to live in harmony with nature. Corporations like Monsanto threaten the future of nature and the lives of everyone and everything with their attempts at controlling nature. The Government states GMO’s are safe, without evidence corroborating their words.